Scuba diving is an exhilarating activity people of all ages can enjoy. While you scuba dive, you can explore unique species in their natural habitat, encounter creatures you’ve never dreamed of, and create great memories with your friends and family you’ll never forget. Hussain al Nowais and his family are certified scuba divers who love exploring the deep seas off the shores of their home in Florida, as well as during their travels around the world. Here are some of their favorite dive sites. Great Barrier Reef – Located off the coast of Queensland, Australia, the Great Barrier Reef is the world’s largest and healthiest coral reef system. It’s composed of 2,900 individual reefs, 600 continental islands and 300 coral cays. The reef is also home to an estimated 1,500 species of fish, 4,000 breeds of clams, 500 types of seaweed, 200 species of birds and many varieties of sea turtles. Punta Gorda, Costa Rica – This dive site is located off Guanacaste, Costa Rica and is home to an abundance of sea life. You’ll be likely to encounter giant schools of eagle rays as well as hundreds of colorful fish. As you dive deeper, you may encounter large whales, dolphins and even sharks. Kailua Kona, Hawaii – Before Australia’s Great Barrier Reef took the title, Hawaii had the largest marine reserve in the world. Found off the coast of Hawaii’s Big Island, at the Kailua Kona dive site you’ll discover schools of colorful tropical fish, giant sea turtles, stingrays, sharks and whales. You may even come across an endangered Hawaiian Monk Seal. Sand Key, Florida – The Sand Key dive site is one of the most popular reef destinations off Key West. 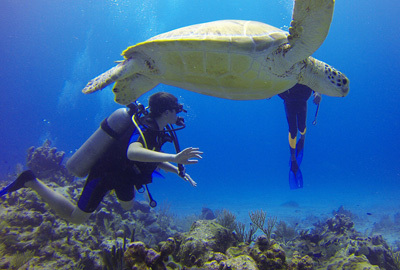 The site is great for beginners and experienced divers, as it has over 10 miles of coral reefs of various depts. Why is Now the Best Time to Travel to Europe? © 2019 abouthussainalnowais.org. All Rights Reserved. Coller Theme by Rohit.